Variable posture mattress platforms (sections in the base under the mattress which can hinge to form a backraise and/or a legraise). Drop down or detachable safety sides. 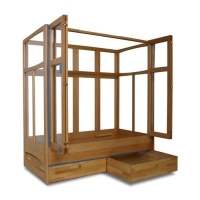 Trendelenburg tilt (this feature allows the entire bed to be tilted towards the head). Reverse Trendelenburg (tilted towards the feet). 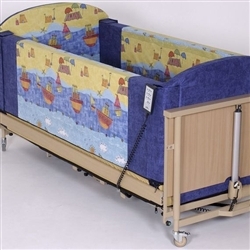 It is very important to note that some of the beds listed here are not suitable for children aged under 12 years (or small adults/young people of a similar size). This is because of the possible risk of a child becoming entrapped in the bed's integral rails. Always check with your child's therapist, and/or the manufacturer of the bed that the bed in consideration is suitable for your child. Read more of our advice on bed safety rails, or go straight to the MHRA's bulletin entitled 'safe use of bed rails'. 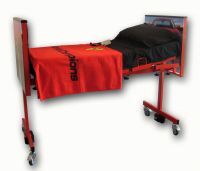 Height adjustable beds are helpful for several reasons. If the height can be lowered, children who can climb in, and children who can transfer sideways from their wheelchair may be able to transfer independently. 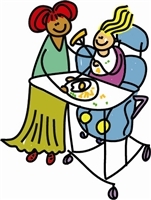 An adjustable height bed will also reduce the risk of back strain to the parent or caregiver - particularly if the bed surface is used as a changing and dressing table. 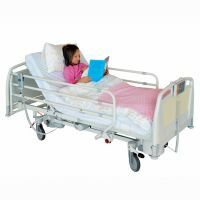 Wooden models may blend in more within the bedroom environment; metal models may offer additional features such as the facility to attach medical equipment (but check this with the supplier of the bed). 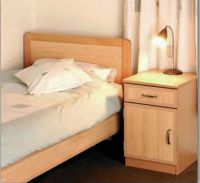 When considering a bed, an individual assessment with an occupational therapist may be required. Your child's safety in the bedroom is very important and there may be individual factors which determine which equipment best suits your child's needs. The information on this site is not a substitute for individual assessment.